LOS ANGELES - Oasis fan Katy Perry will be again in Milan on 23 February (see here), tickets from today. This event will be at Taj Rambagh Taj Palace hotel in Jaipur. They’re one of Hollywood’s happiest couples and in a little over one week, Katy Perry and Russell Brand will reportedly become husband and wife. According to Us Weekly, the American pop star and her British comedian boyfriend are set to marry on October 23. Various outlets, including Us Weekly and Britain’s Heat magazine, have reported that the pair will tie the knot in India in a lavish ceremony, which will last for almost a week. Heat reported that the guest list includes pals Rihanna (who recently hosted Katy’s bachelorette party in Las Vegas), Russell friend's former Oasis guitarist Noel Gallagher, David Walliams of HBO’s “Little Britain USA” and UK talk show host Jonathan Ross. The guests will be flown in via private jet, Us Weekly reported. According to both mags, the couple will take part in a host of Indian traditions for their nuptials. Heat reported that the pair would have their hands tied together with special threads, and Russell will have a red dot made of turmeric powder put on his head by Katy’s relatives. Additionally, Katy’s bridal gown is also expected to pull from Indian tradition. “Katy wants to wear a sari,” a friend told Heat. 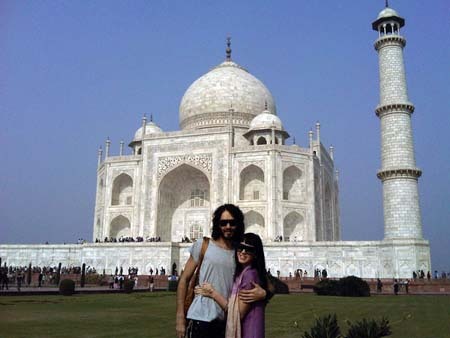 Katy and Russell famously took a trip together to India last year, later revealing it was there that Russell proposed to the “California Gurls” singer. While the wedding date is approaching, Russell is keeping as quiet as he can about it. Reps for Katy and Russell did not immediately respond to requests for comment from Access Hollywood. In related news, Katy has been announced as one of the headliners for “VH1 Divas Salute the Troops” alongside Nicki Minaj and Hayley Williams of rock outfit Paramore. The ladies will perform for the service people at Miramar, the Marine Corps Air Station near San Diego. “VH1 Divas Salute the Troops” will air on Sunday December 5 at 9 PM on the cable network.